I’m worried. I drove over to Fresno Piano on Ashlan this afternoon after my return from the Bay area. With an instant camera tucked in my pocket, I would prove my point that acoustic pianos were on their way out and digitals were fast taking over the marketplace. Even before I reached my destination, I received bad news. Our Music Teachers Association President shot off an email that the store had announced its imminent closing. Mark down sales were around the corner. Despite a shell-shocking article in California Magazine that described Fresno as “a no man’s land with endless miles of strip malls,” the local piano dealership seemed to stand apart as a repository of Steinway grand pianos and high culture. It always enjoyed a loyal following of buyers and had a nice stock of pianos that included a cadre of Baldwin grands filling a large share of its 5000 sq. feet space. Imagine my stepping over horse dung to get within reach of this precious French provincial style beauty. 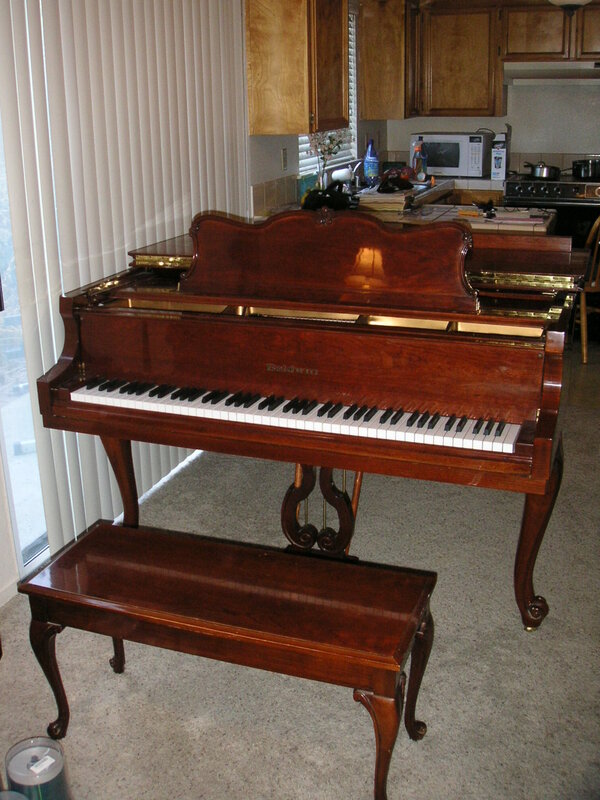 Fresno Piano was clearly more accessible to most piano buyers, and it seemed to be growing by leaps and bounds. 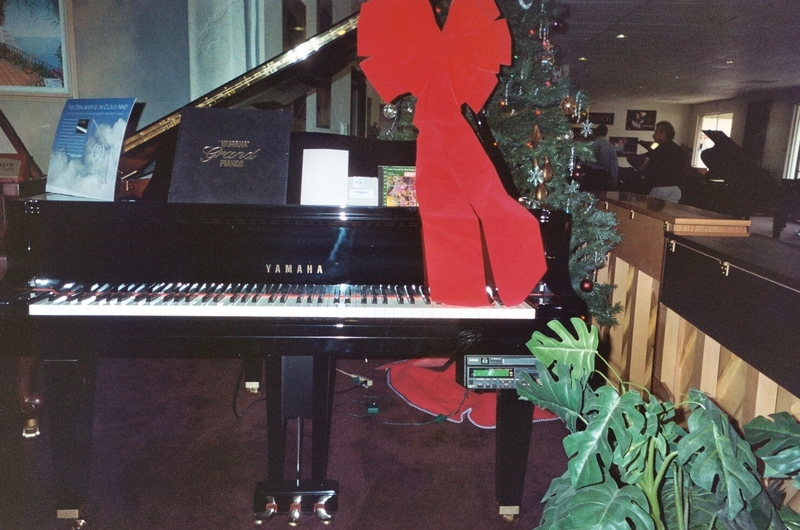 In fact, it acquired the Steinway dealership after Sherman Clay left Fresno, and it even added a Steinway parlor within its space that was decorated by eye-catching paintings of Rachmaninoff, Paderewski and Vladimir Horowitz. One of these parlor housed grands had been hand-picked at the Steinway factory in Long Island by a team from Fresno Piano that also included the conductor of the Philharmonic, its Executive Director, and a concert pianist from the East Coast. The glittery event was covered coast to coast by Fresno Magazine. The piano selected, a 9 foot Model D, was purchased for about 105K and became the Philharmonic’s official, NEW piano, replacing the old one that had been ill-maintained for most of its playing life. The lazy, sticking notes, poorly voiced registrations, and lack of overall regulation, had irritated Jeremy Menuhin, in particular, who publicly apologized for his performance of a Mozart concerto before he sat down to play. It evoked memories of Leonard Bernstein doing the same to Glenn Gould when the conductor dissociated himself from the pianist’s unorthodox performance of the Brahms Concerto in D minor back in the 1960s. Those were the days when the PIANO reigned, and not a digital could remotely compete with the King of instruments. Now well into the Millennium, Craig’s List featured fewer ads for acoustic pianos, and had a laundry list of clunker uprights for quick sale. The battery powered, or plug in keyboards took up the most space and were picking up steam. My trip to Fresno Piano verified this consumer turnaround. Greeted by the “Yamaha DGB I with Disklavier Mark iii, I thought to myself, “Was this a launching pad for another unmanned satellite?” A handsome piece of hardware with every computer generated option known to mankind stood on a raised podium giving it a sense of entitlement. I could easily sit down at this thing and have a full orchestra accompany me while I plunked out a simple right hand melody. No last wish was unfulfilled in sound space. Whatever I imagined as my ideal orchestration was at my fingertip command. Hours, days, months, years of instant musically generated gratification awaited me and millions of others with lesser performance skills and musical background. This piece of hardware, while impressive, was by no means as striking as the Roland that was off to the side. A musical turbo, it definitely grabbed the lion’s share of attention when customers entered the store. Okay, so the gist of this particular piece of space technology, I mean entertainment center, I mean simulated piano… do I have it right? — was to make it easy for a user to have a nice playing experience without much challenge to his or her technical/musical skills. All good and well. Endless hours of listening and playing pleasure was of no harm. But what about the stock of acoustic pianos at the Fresno Ashlan location? I was curious about the sales report for the past year. Hans Oviedo, sales rep, spoke candidly with me. “We sell about 50/50, but the digitals are fast moving ahead these days.” Another salesperson put another spin on it. The pricey technology was not moving, he said, and it couldn’t offset the losses associated with acoustic piano sales. Certainly, the Steinway pianos in the parlor were fixtures for too many years. I didn’t see any sign of an overturn. In fact, I played the same M, O, and A models for month after month. My preference was a model B that wasn’t the centerpiece of the parlor area. It stood off in a corner without much fanfare. The Philharmonic’s Steinway D, grabbed all the attention, being roped off on display between concerts. If I hadn’t been over-saturated with digital hardware mania during my visit, there was still another enclosed area in the “piano?” store that I hadn’t yet investigated. It was a small room that housed the CVP09 with a big computer screen. Wow! Very nifty. I soon found myself singing along and toe-tapping my away across the room to the tune of “California Dreamin’,” or something resembling that title? I had meant to jot down the name of the jazzy tidbit but I was too distracted by the dancing notes, having a blast of a time in this “video arcade”? But wait a minute? Where exactly was I? 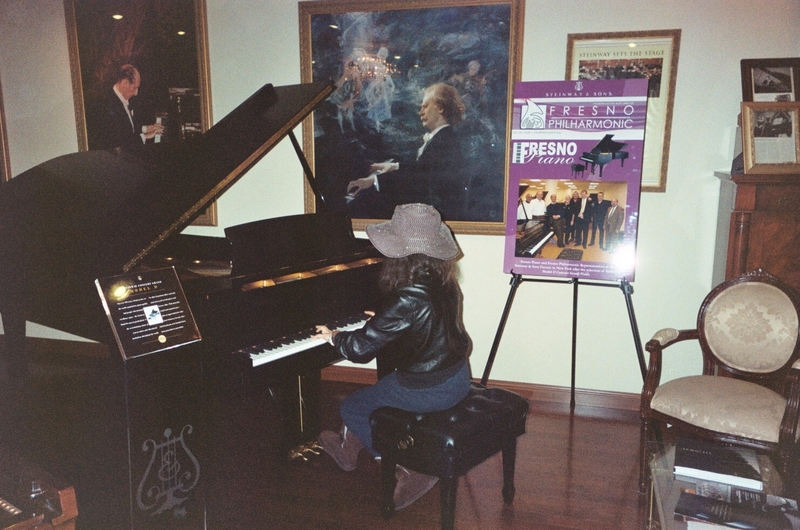 Was this the Fresno Piano store where I used to bring students to try out real pianos over the years? This same establishment hosted the Music Teacher’s Association meetings each month, and many of our students would have the opportunity to perform onstage in the beautiful, chandelier decorated space, running their fingers over a magnificent Steinway grand. The good news was that the space age merchandise had not yet made it to the recital hall, though on one occasion a Clavinova sat beside the grand because someone forgot to move it back to the main floor. The Clavinovas were big sellers over at Fresno Piano, because students at the music school within the store purchased them after having had several months of group classes. To me, everything was still about the economy stupid. The creeping recession had knocked sales down in virtually all areas of the marketplace and while pianos were temporarily losing their appeal among buyers, there was still a heaven sent niche market: Buyers who had cultivated tastes in finer musical instruments would purchase pianos. And Steinways would still be sold to universities conservatories, and orchestras around the world. Nonetheless, if real books were being replaced with Internet generated E books, it was no surprise that acoustic pianos were taking a back seat to the space age technology — at least for the time being. One problem would still remain: price tags on the Disclavier and Roland were far too inflationary at 14 to 15K to lure interested, pie in the sky consumers. The more low budget electronic pianos, easily transported and put on a music stand, saved space, and didn’t need tunings. Many of my students and friends had gone that route in the face of the depressed economy. So enter Guitar Center as the next takeover store in the wake of Fresno Piano’s demise. Every man’s instrument haven, perhaps? If you wanted to go Casio PX120 or 130, you could probably cut a deal for $425 to $450. Not bad, but these digital keyboards wouldn’t give you a big orchestra to cushion a few modest treble-based melodies. Besides they were tinning out, and had wobbly, blubbering keys–plus no notes bouncing on a computer screen to shoot down with a BB gun when you became frustrated with the sounds coming from your portable. In summary, I can only hope that in the not too distant future, there will be a resurrection of acoustic pianos in the good company of digitals. Maybe by Easter, 2012, a miracle will happen and we can celebrate by singing the “Allelujia” Chorus from the Messiah. Next postCato, his Killer Keyboard, and a round of piano lessons! I enjoy reading your blog. I own the very model Roland (KR17M) that you pictured in this installment of your blog. I like the way it feels, sounds and looks very much. I’m wondering if you had a chance to play the Roland? I’m a retired self-directed learner who is learning to play mainly pop music (I’ve added a link to my YouTube channel above under Website). I’ve often wondered what a “real” pianist such as yourself would think of the action and sound of the Roland. Thanks so much for your reply. You are right about the default reverb – It is pretty intense. One of the things I like about the Roland digital grand is that there are almost infinite settings to play with (for example there are about 30 different types of reverb each with 50 gradations). I really enjoy playing around with the different effects, voices and settings. Since I play mainly pop music it is fun to try different voices to accompany my (pathetic) singing. I can see how the special effects would be appealing. The younger kids that I teach are entranced by the variety of sounds and colors produced by a good digital. Regarding digital vs acoustic pianos, I offer my comments in favor of acoustic pianos. I am a 76 year old woman who has studied classical piano, intermittently since age 7. I was trained on acoustics all my life. 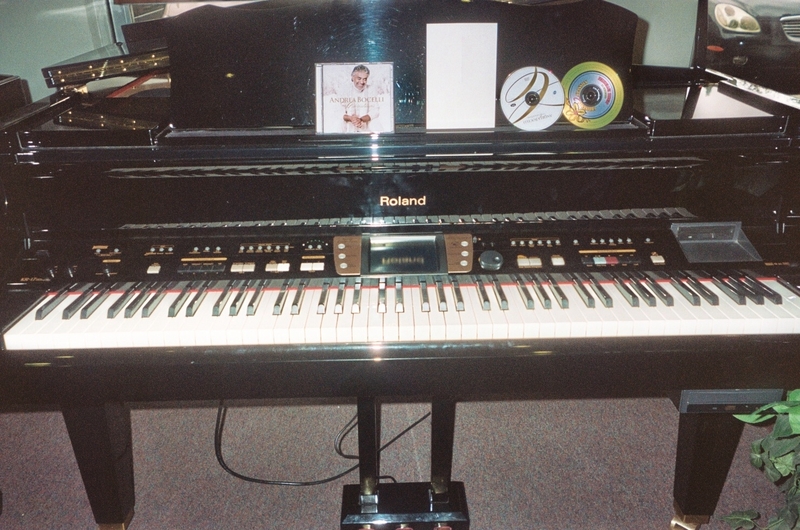 My pianos were used uprights, different brands, we could not afford new ones when I was younger, later I purchased Yamaha Clavinova digital pianos thinking they were a suitable, acceptable replacement. I was wrong. 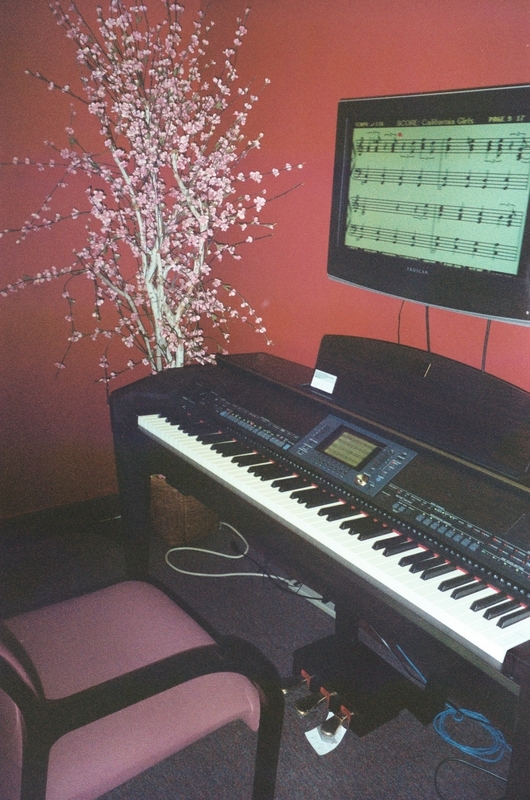 Seduced mainly by the price (lower than acoustic) and the ease of maintenance compared to an acoustic, I recently purchased a new Yamaha Clavinova CLP 340 digital piano. This is one of the newer, high-end digital pianos made by Yamaha. I stayed away from more expensive Yamaha digital models which include many more features than mine. I allowed myself to be bewitched by the salesman’s pitch, the piano sounded wonderful when I tried it out. I was a fool. The Pros: Digitals don’t need tuning, you can move them anywhere yourself without calling movers, costs, etc., you can put them anywhere near windows, dust, heat, cold, and not worry about the effect on its innards – you can pound on them and no strings/hammers break nor get worn out, pedals don’t get messed up. You can link them to your computer and create/record all sorts of orchestral sounds or combine your performance with a variety of other digital instruments. My revelation: Recently I performed at a recital using a 5 foot Boston Grand (made by Steinway). I played the Lizst Hungarian Rhapsody #2 in C# Minor, arranged for intermediate to advanced pianists. I was totally enraptured by the depth, the richness of sounds, the control I had over the keys and pedals, the way I could capture meanings that I had never elicited in my digital. Playing in a large hall probably also made a difference with the reverb of a large auditorium. I arrived very early to practice and acclimate myself to the piano – I had a glorious time with it during practice and during the actual recital – I had total confidence in myself because I knew this piano would deliver whatever I told it to do. The Cons of Digitals: Digital pianos are missing the most critical, prized ingredients of the piano – glorious acoustic sound and responsiveness of the keyboard and pedals – which should be a classical pianist’s primary concern. Digitals prohibit a pianist’s ability to interpret scores ad libitum with pedals, and the magic of our hands/fingers on the keyboard – a digital is simply not expressive enough – it can’t be done on any digital piano that I have tried out. The digital keyboard is not as sensitive to my touch as the acoustic. A “real” piano student must study on an acoustic – end of story. Don’t get seduced by all the bells and whistles on the array of digital pianos for sale. It saddens me that many local acoustic piano dealers are going out of business – the electronics/digital age generation is overtaking and replacing the beauty of acoustics – we are becoming robots playing a robot-like instrument – the realm of interpreting music is lost – the digital piano controls us, we don’t control it. I read your thoughts and additional contributions of others with great interest. I have been (and still am) a piano dealer for 40 years representing all the major brands at one time or another. We also carry digital pianos so my experience has been, for lack of a better expression, “well rounded”. I too like acoustic pianos, but to be honest, we have to sell what people are buying. I look around my showroom and see acoustic pianos that have been on my floor for over a year. At the same time, we get shipments of digitals every week. I like acoustic pianos for a completely different reason than your other readers. We simply don’t make much money selling digitals. Recently, our main supplier has decided to focus on the lower end digitals with price points that bring us 10 to 15% profit margins. Pay with a credit card (3%) and we’re down to single digits. No matter how you cut the cake, you can’t pay the bills with those types of margins. I had hoped the digital pianos would help us keep the doors open, but now that no matter how many we sell the profit is out of those, we don’t know what to do next. I think your going to see a lot more piano stores closing in the next year unless things turn around drastically – which no one believes they will. Another interesting side note. One of your writers talked about her playing a classical piece an acoustic grand she liked. We learned a long time ago, it seems to be only the classical musician who prefers the Acoustic. Flip on your car radio – how many classical stations do you hear. Perhaps in Fresno there are a few – but where we live in the center of the country there are NONE. One other small correction. Your reader said she played a Boston “made by Steinway”. To be sure – Boston’s are made by Kawai for Steinway, just as their Essex is made by Pearl River. Steinway will give you a big song and dance about their “designed by Steinway” but in my experience I can’t see or tell the difference between the Boston and the Kawai. I have sold both the Steinway and the Boston and in my opinion the Boston was far better built than the Steinway, but Steinway didn’t built it, Kawai did. In the industry, many are wondering if Samick of Korea will start to build these “off name Steinway’s” since they have purchased so much of Steinway’s stock this past year. I guess time will tell. In summary, it’s been a rough couple of years for the piano industry. Lot’s of dealers have closed their doors. You may wish to check the stat’s as published by Music Trades Magazine which will show you just how few acoustic pianos are still being made. I seem to remember their recent issue said that less than 1,000 grands were build in the USA last year. If correct, that would be the total production for Charles Walter (built in Indiana), Mason & Hamlin (built in Mass) and Steinway (built in New York) all put together. That’s darn few pianos to keep those plants open. Good luck, keep up the interesting writing. Bill, Thanks for the sobering commentary on what’s happening in the marketplace, both in acoustic and digital sales. I have to agree with the lion’s share of what you say. Actually, the Boston and Essex pianos have not been my favorites by any means. I have escorted any number of students through our local dealership without so much as taking a liking to any of the floor featured pianos, with the exception of the pricey Steinways in the parlor. (they obviously aren’t moving. Who has the $$$ in this flailing economoy. me and I ran a you tube on it, that’s how enthusiastic I was for a glimmering moment, before a colleague in MTAC grabbed it for herself. A couple of my students, serious minded people, have opted for the Casio Privia line.. which is okay with me..They don’t have much of a choice at this time in their young adult lives. Some day in the future they might find a nice Baldwin Acrosonic. Fresno Piano had to close judging by what you in fact describe. What irritates me, however, is Steinway deceptively attaching itself to pianos it has no real design or manufacturing relationship to.. I had heard about this before and the news was crushingly disappointing. I await an avalanche of criticism, but so be it. As I mentioned three dealerships bit the dust here in the past three years, and all that’s left is Guitar Center, for what it’s worth. They will sell the digitals and corner the market. Thanks again for your valuable insights. They needed to be aired and shared. I am not savvy in the universe to which you refer.